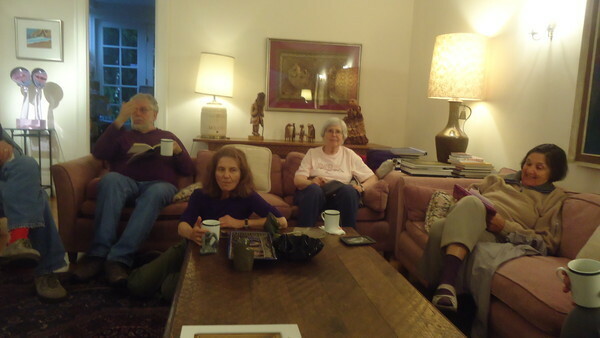 Less than six degrees separated attendees at a Berkeley-based Book discussion group. I knew the moment I entered the living room of Mike and Adrianne Fine Bank for an Oberlin alumni-sponsored book group event on Berkeley’s Le Roy Avenue, that people whom I’d never met, would be in some way related to me. And not a trace of a blood tie would bond us. 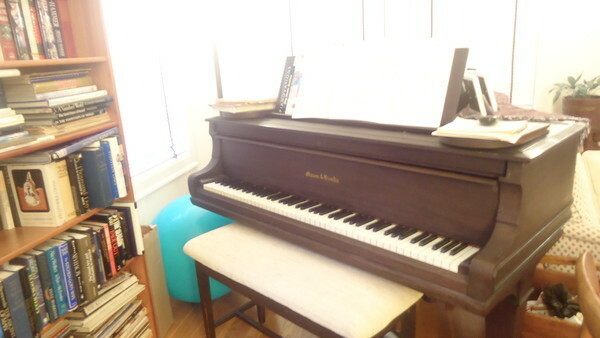 Even the inanimate, vintage Mason and Hamlin grand that sat nobly in the living room of this splendid home, pulsated with vibrations of recognition. It hearkened back to my piano student days in New York City, when a namesake instrument graced the salon of my beloved teacher, Lillian Lefkofsky Freundlich, Oberlin 1933, and overshadowed a Steinway Model A.
Mason Hamlins were mellow-sounding instruments. They sang like nightingales when stroked with fingers attached to supple wrists and relaxed arms. It felt like velvet playing one, if it was well-maintained and managed to escape extremes of humidity. Lil’s was in perfect condition, prepped for the big student recital. I played the first movement of Beethoven’s second piano concerto with Jamesetta Holliman, Conservatory, 1959, who completed a triad of connections that resonated well into the present. She sat at the neighboring Steinway providing the orchestra part. Steven E. Gilbert, popped up on this end-of-year concert, performing the works of Schoenberg. Though he’d graduated Yale, his relocation to Fresno to teach Theory at the State University brought a new web of Obie-based musical connections. One included Helene Joseph-Weil, Oberlin Conservatory, 1962, who was a Professor of Voice at FSU. Agriculture’s heartland produced an especially heart-warming Obie connection. It was my destiny to bump into Roselle Bezazian Kemalyan, Conservatory,’32, who had roomed at Oberlin with Lillian Lefkofsky. Roselle endowed the Bezazian Piano Scholarship as her legacy to the school, and hosted many Obie Hauskonzerts in Northwest Fresno. Roselle introduced me to Charles Wesley Bird, Oberlin, 1929, who was an English and French major, but especially adored organ and piano music. He patronized our local Keyboard Concert series and attended all my benefit recitals, waving an Oberlin banner. Fast forward to the Berkeley Book Club event, and a gush of Oberlin memories poured forth. These touched periods of my life I least expected to revisit. The Sense of an Ending by Julian Barnes, was the featured book. It elicited thought-provoking responses from a circle of intellectually-primed Obies. What else would I expect? My interludes in college classes that interspersed intensive exposure to theory, music history and applied study performance in the CON (Conservatory), exposed me to professors like Andrew Bongiorno (English) who quoted Dante in Latin at any opportunity. Through these mind-expanding courses, I sat beside students like Robert Kuttner and Ted Morgan who became great journalists and commentators after graduation. George Von der Muhll, who obtained his BA from Oberlin College (1956), and “studied the interrelations of philosophy, economics, and political science at the London School of Economics, and obtained a Ph.D. in Government from Harvard University,” turned up at the Berkeley literary convergence with powerful commentary about the Barnes book. No sooner than he uttered a profound word, I was back in my seat at an Oberlin Philosophy class sifting through dynamic exchanges between students and professors. No comparable level of cerebral intensity permeated classrooms at the New York City High School of Performing Arts, where academics were at the very bottom of a performance- based pyramid. Students like myself who earned high grades in History or English were ostracized. Starry-eyed, stage-struck kids belonged to an elite Club of conformists. The academically stimulating Oberlin experience was a pleasant shock to my nervous system and it was rekindled on Le Roy. Von der Muhll, who sat beside me in a classically beautiful North Berkeley home, departed from his stimulating commentary to strike a musical chord of recognition. He waxed poetic about Jack Radunsky, my Oberlin piano teacher. But an even more unique connection between us surfaced following the book meet-up. It dated back to my childhood years in the Bronx. I had learned that George had worked for Representative William Fitts Ryan who was my Congressman when I lived in the Marble Hill Projects. According to an authorized bio that popped up in one of Von der Muhll’s published writings, “CIVILIZATIONS: THEIR RISE, FALL, AND CLASHES” he had also done the same for Hubert Humphrey. More connections flowed out of Book Club introductions. Ann Maria Celona, a Berkeley-based architect, class of 1973, shared memories about her piano lessons with Arthur Dann, while husband, John Mello, Obie, 1971 interspersed remarks about his guitar-making in Kensington. A luthier vocation, not far removed from my former violin studies, produced a link to Stuart Canin, Oberlin string professor, who had migrated to California to become the San Francisco Symphony’s concertmaster. Ex-New Yorkers, and former residents of Manhattan’s West Side, they had met in Oberlin after having unknowingly lived near each other for years in the West 80’s. I, likewise inhabited a West side apartment not too far from them on West 74th. Could I claim a connection to the Banks as part of my current search for a suitable place to live in Berkeley? Maybe a music-friendly place would become available in their neighborhood? I dropped the word, in the networking spirit. Finally, where did “Maggie,” the dog fit into shrinking degrees of separation among Oberlin grads? I wasn’t sure. 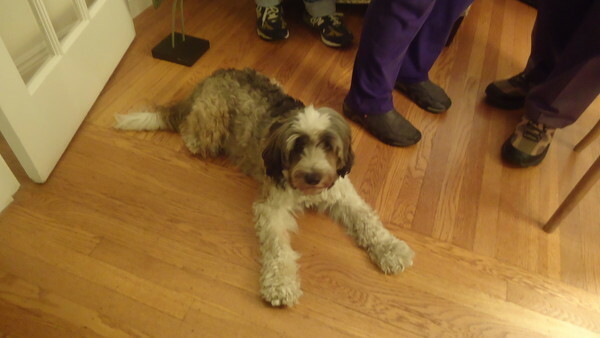 Nonetheless, the Tibetan terrier stole the show, reminding me of a canine whose paw was trapped under a Steinway pedal when I played an Opera League benefit in Fresno some twenty years ago.